USMLE (US Medical Licensing Exam) is a 3-step examination that is required from graduates of medical schools from all over the world in order to apply for a residency position in the USA, which leads to independent practice in USA. The USMLE steps 1 and 2 are required at all US medical schools, and international students or graduates need it only if thay want to work in the USA. What is Step 1 for? USMLE Step 1 takes time, effort/dedication, and money. It can give a sense of success for a little while, but consider it always from your ultimate goal: do you want to work in US as a resident, even with the negatives? If your answer is "yes", or at least "likely yes", you are welcomed to read further. 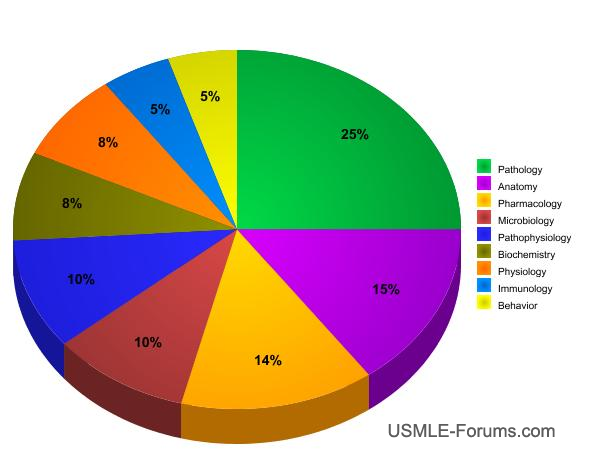 USMLE Step 1 is the first of USMLE examinations, and the resulting score is very important for matching. Step 1 comprises questions on pre-clinical subjects (see the picture), but the knowledge is tested in a context of a narative of a imaginary patient. The facts tested are frequently abstract logical sequences/relations, that connect a cause, an effect, and a modulator. Predictors of Step 1 score include MCAT score, reading vocabulary, abstract conceptualization, medical school grades and number of practice questions taken in preparation for the exam. Technically speaking, Step 1 is multiple choice test (single answer most correct), that is taken in 1 day. It has 7 blocks. There is 40 questions in each block and you have 60 minutes to answer them (90s per Q on average). There is 45 minutes for breaks (which you can split as you want), and 15 minutes for tutorial (which you can download and do at home, skip it on the test day and gain additional 15 minutes for break). Score above around 200 is pass, but to increase your chance of good job, you should aim to beat the mean. And some competitive specialties require > 90 percentile (especially from IMGs). The image above is from 2014, and the students seem to be more comptitive each year. How can a single test comprise all these subjects? Well, it does not cover all details of those subjects, but rather asks important, interesting, or possibly clinicaly valuable information. How do I know what is important and what not? Rule o thumb is anything that is listed in First aid for the USMLE Step 1 (let's call it just "FA Step 1" or just "FA"). Ta-daaa, this is the book that you will definitely need for success in Step 1. Is the FA the only think I need? No. FA is needed, but not sufficient. Questions come in a context of a single patient ("clinical vignette"), and it takes some time, effort, and practice, to see through the patient story the abstract mechanism, and grab the answer. Notice, that that if was number of practice questions taken, not time spend with FA that corrlated with final step 1 score. Bottom line: use the FA with USMLE-like questions or imaginary patients. Where can I get practice questions? Some textbooks have Qs in the end of the chapter. There are dedicated Q-books, and Q-banks, which are probably the most powerfull. UWorld has a great Qbank, but there i more. Sounds like it's giant beast test. How is it doable? You need time, dedication, plan, and stick to the plan, to reach any goal in life. It is a difficult test, but in the end, it's just a test. As Stepan Capek put it, "make a plan and stick to it". Write up the plan and milestones, plan ahead, and then follow it. And keep enjoying the world. Sounds easy, doesn't it? Is there any evidence this is actually doable? I shared my Step 1 plan, anxiety, path and experience in this long post, but there are thousands more. About 40000 people apply for residency each year, and I would expect even more Step 1 experiences. I would suggest taking it during medical school, when you have your knowledge fresh. The best time is shortly after finishing pharmacology exam (in the early second half of med school). But plan and practice before taking it 6 months to 2 years in advance. I will give you some basic hints what I needed to do back in 2012 though: registration at ECFMG.org, up-to-date info about exam day at usmle.org, and scheduling the exam at Prometric.com. My long post from 2012. Oh, man, I am getting really old! . 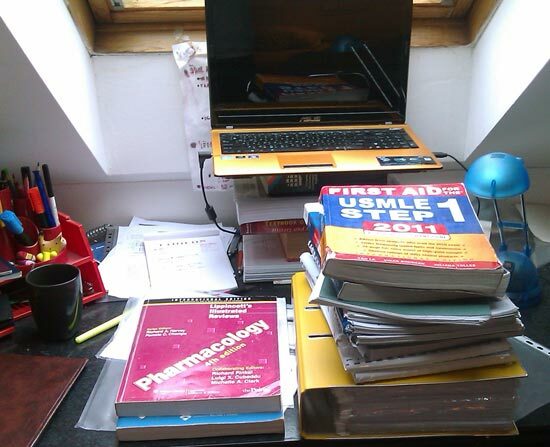 Good luck in your endavours, whether it involves USMLEs or not! Before taking CK, you shoud practice about 2000-3000 questions. The more the better. Where to get them?